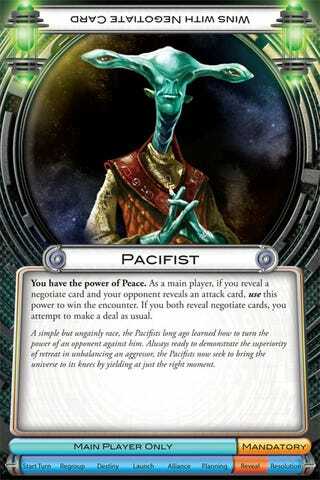 Cosmic Encounter is a classic board game of intergalactic warfare, trade and diplomacy that is beloved by pretty much everyone who's ever played it. Out of print for several years, the game is ready to make a big comeback with Fantasy Flight Games. There are 50 alien races represented in the game (seriously...50! ), and expansions are already planned, so your cosmic encounters will not lack variety.Cosmic Encounter has gone through a conga line of publishers since first being released in 1977 (that's the Avalon Hill version pictured below). Each publisher altered the rules slightly and introduced various expansions. Fantasy Flight is creating a game for 3-5 players that will last one or two hours. The game board is highly variable - the planets are not hex shaped, so players can set them up however they prefer, and designer Kevin Wilson is leaving lots of room for expansion sets. Players compete to form alliances and acquire five colonies outside their home system. Each battle or trade deal can result in a strange effect or new power for an alien species, and the shifting alliances keep everyone on their toes. With a release date set for "late 2008," I am definitely putting this on my Christmas list. Images by: Fantasy Flight Games and boardgamegeek.com.